The 1910s was a decade in which theories of socialism, pacifism, and collectivism flowered. Publicists and playwrights from Sidney Webb to George Bernard Shaw expressed not just belief in "utopianism" but a vigorous assault on the existing political and economic order. Less well known is how a group of Tory thinkers laid the foundations of a conservative counter-attack expressed with equal literary and intellectual brilliance. Foremost among them was W. H. Mallock. In The Limits of Pure Democracy he argued that the pseudo-populist leaders of the political party system promise everything but deliver only the end of parties as such. 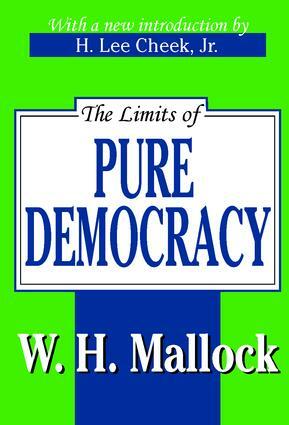 For Mallock, what starts with populism ends in dictatorship. The Russian Revolution was simply the historical outcome of utopian socialist visions that were more dedicated to destroying the present system of things than bringing about a revitalized future. Mallock's book explains how the modern free market succeeds through competition in increasing output, broadening occupational opportunities, and multiplying the numbers of skilled professionals. In contrast, welfare schemes serve to deepen poverty by spreading wealth so evenly that incentives to work decline and personal savings are eliminated. These arguments have become commonplace today. But at the time they served as an incendiary reminder that class warfare works in both directions.